Summer months are when Information Technology Services (ITS) prepares for the next academic year. 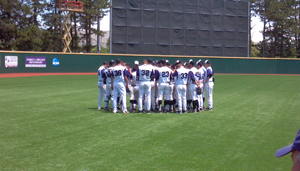 This summer may prove to be the busiest summer on record for ITS, and it got even busier with needed support for the NCAA regional tournament in June. The email upgrade committee will have a demonstration of the calendar functions in Google Apps for Education and Microsoft 365 from 1:30-3 p.m. today in the Big 12 Room at the K-State Student Union. Seth Galitzer, computing and information sciences, and David Williams, housing and dining services, will be presenting the calendar functions. To ensure adequate space, please RSVP and provide any questions that you would like to see addressed in the presentation to https://surveys.ksu.edu/TS?offeringId=202278. K-State’s email service provider, Merit, experienced a hardware failure Thursday, Sept 27. While many of the mail stores are back up, they will continue through this morning to restore the remaining data. Question: How do I use Zimbra Briefcase to share folders with others? 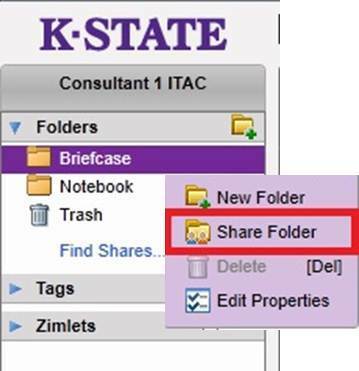 The “Briefcase” sharing feature of Zimbra webmail allows you to give other users permission to view files in your Briefcase, even if they do not have a K-State account. Below are step-by-step instructions to quickly share information with others. 1. In Zimbra webmail, click the Briefcase tab. 2. Right-click the folder you want to share and then click Share Folder. Have you ever wondered if you were the only person on campus with a particular computer problem? Got a quick technology question and don’t know who to call? Contact the IT Help Desk, 785-532-7722, e-mail helpdesk@k-state.edu. Question: I need to send out a portfolio for an internship, but the files are just too large to attach by email. How can I get this project out? Question: I am trying to send an attachment to my email in Zimbra webmail. What is the limit on the file size? IT Help Desk: The limit for each email in K-State’s Zimbra system is 50MB (megabytes) including attachments. That’s 51,200KB (kilobytes); 1 megabyte = 1,024 kilobytes. That is substantially more than most email service providers allow (typically 10-25MB). So, when you are considering sending a large file attachment, first check the file size. This does not take into consideration that a file attachment needs to be encoded — which typically adds roughly 30 percent to the file size. That means the upper limit for a file attachment(s) is closer to 35MB. It depends on the content of the attachment. Information Technology Services transitioned to K-State Zimbra Calendar on June 28, 2010. As part of the transition, Oracle Calendar will be decommissioned on July 1 this year. K-Staters with data still in Oracle Calendar have options to archive their data; instructions are available on the Moving Oracle Calendar data to Zimbra Calendar webpage.